Qualifying for the NASCAR Sprint Cup Series Aaron's 499 race at Talladega Superspeedway took place late Saturday morning on the 2.66-mile high-speed oval. 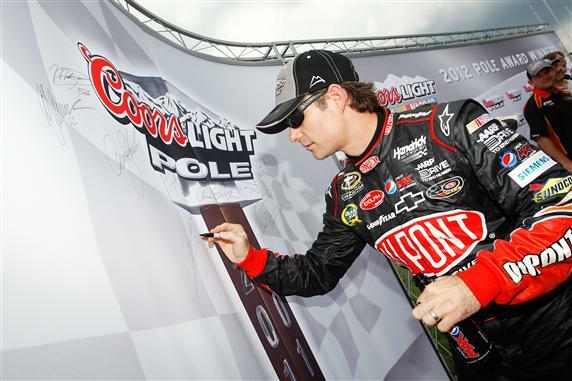 Prevailing in qualifying with his first pole of 2012, Jeff Gordon and the #24 Chevrolet fielded by Hendrick Motorsports clocked a 49.973-second time averaging 191.623 miles per hour. Just 0.034 seconds behind Gordon was the #22 Dodge of AJ Allmendinger. Allmendinger starting 2nd, Marcos Ambrose placed third-fastest and Aric Almirola in 4th are all driver hunting for a first-career Sprint Cup victory. A wide-open race track known for first time victories since Richard Brickhouse won the inaugural 500-mile stock car event, Talladega Superspeedway last played host to Brad Keselowski's first-time win in the series in 2009. As well as searching for a first NASCAR Sprint Cup race win at Talladega Superspeedway, Allmendinger is one of two Dodge Charger stock cars attempting to place the brand in the Alabama victory lane for the first time since 1976. This is the second year in a row that Jeff Gordon will lead the field to green in the spring Talladega event and the third straight team a Hendrick Motorsports car starts at the front of this NASCAR Sprint Cup race. Hendrick Motorsports enters the 2012 spring race as the defending winner after Jimmie Johnson was pushed to victory by teammate Dale Earnhardt Jr. Still chasing the 200th NASCAR Sprint Cup Series win for the organization, Hendrick Motorsports cars behind Gordon are scattered. Kasey Kahne's #5 Chevrolet starts 5th while #88 Dale Earnhardt Jr is positioned 18th ahead of the #48 of Jimmie Johnson in 19th. NASCAR Sprint Cup driver points leader entering the 10th race, Greg Biffle will start 6th in the Aaron's 499 with the #16 Ford Fusion. Biffle starts one position above Roush Fenway Racing teammate Carl Edwards at Talladega. The 2012 Daytona 500 winning #17 Ford of Matt Kenseth starts 10th behind his teammates seeking to establish two-straight restrictor plate wins in 2012 if he can finish up front at the end of 187 laps. Roush Fenway Racing is chasing their first win at Talladega since Jamie McMurray took the team to a 2009 victory in the fall event.